Locations on the surface of Ryugu have been named! [open in another window] Figure 1: Map of Ryugu showing the place names. 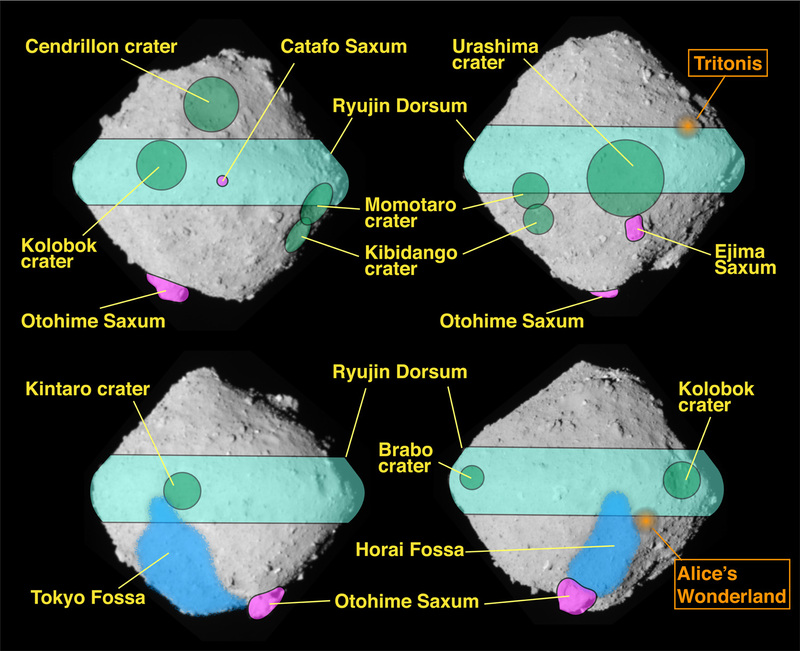 [open in another window] Figure 2: The location of place names on Ryugu. The princess who lived in Ryugu castle and entertained Urashima and who gave him the treasure box (tamatebako). Where Urashima rescued the turtle and left for Ryugu Palace. (Note 1) While “Cinderella” was proposed, the WG modified the name to the original French. (Note 2) “Peter Pan” was proposed but changed by the WG due to copyright issues. (Note 3) “Sleeping Beauty” was proposed but it was suggested that the character number was too long, so “Brabo” was proposed and accepted. (Note 4) “Oz” was proposed but this is used for Charon (moon of Pluto) so was changed by the WG. ※1. Place name core members (in no particular order): Rina Noguchi, Yuri Shimaki, Makoto Yoshikawa, Yuichi Tsuda (JAXA), Seiichio Watanabe (Nagoya University), Hideaki Miyamoto, Seiji Sugita (University of Tokyo), Goro Komatsu (Università d'Annunzio), Yoshiaki Ishihara (National Institute for Environmental Studies), Sho Sasaki (Osaka University), Naru Hirata, Chikatoshi Honda, Hirohide Demura (University of Aizu), Masatoshi Hirabayashi (Auburn University). ※2. The images of Ryugu are from the ONC team (JAXA, University of Tokyo, Kochi University, Rikkyo University, Nagoya University, Chiba Institute of Technology, Meiji University, University of Aizu, AIST).